Hay Bro Sis...On the trail of XSR700 the XSR900 moved in the range Yamaha Sport Heritage presenting in Eicma 2015. Like his youngest, MT-07 “vintagisée” This new motorcycle neo-retro three-cylinder engine of 850 cm3 and aluminum chassis, it also takes as a base a roadster, the MT-09. At Yamaha, philosophy Faster Sons étrennée by friendly XSR700 this year, now seems to be a range within the range Sport Heritage. Because with the XSR900 in 2016, dressed one second MT elements of old forms will be available to support the neo-retro offer Japanese manufacturer. And as it turned his MT-07 in XSR700, it has retained the entire chassis platform / engine of the MT-09 to give birth to XSR900, thanks to a few well-chosen accessories. This retro line – which is observed only on the upper part of the bike – originates at the tip of the front fender, and then extends to the round headlight with nice aluminum supports and behind the accessory, at the instrumentation LCD counter. Tank 14 liters aluminum covers, two-seater saddle stitched, side covers, matt black polished exhaust muffler tip and rear fenders topped by a round LED light round off the array of vintage roadster MT-09 and having adjustable traction control, drive mode, slipper clutch. 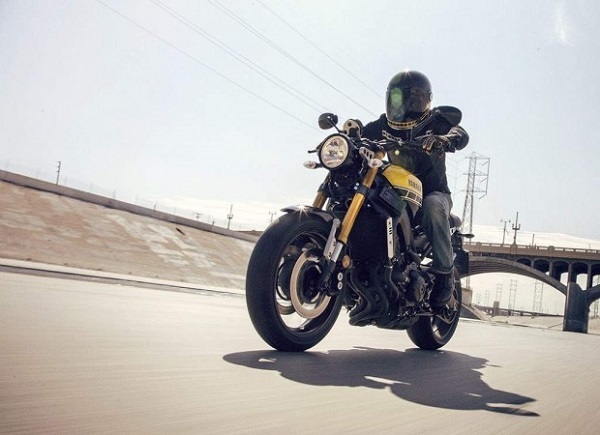 The rest is history, as part cycle engine and roadster are identical to the MT-09. Thus, in the famous aluminum frame cast is anchored on 3-cylinder 850 cm3, approvals on the waterlogged roadster or the Tracer. For now, Yamaha is not communicating on possible changes to the mechanics, to be more in line with the spirit of the new neo-retro. At present, we do not know what most non-performance. Patience, more information with sales prices should quickly arrived !! At the front, the inverted fork to 41 mm tubes has specific settings. It can be adjusted in relaxation. Behind the monoshock based link has adjustable preload and rebound damping. The XSR 900 is also equipped as standard traction control (TCS) as Tracer, except that it is adjustable on 3 levels. Finally, this new retro slipper clutch has assisted Yamaha, three modes of conduct are made available to the driver and ABS is part of the standard equipment. Available in matte gray, blue Slate Rock and 60th anniversary colors also available on the XSR700 2016, The XSR 900 goes on sale in February 2016.